Israeli Prime Minister Benjamin Netanyahu has revealed what he says are "secret nuclear files" proving Iran once covertly pursued nuclear weapons. He said thousands of pages of material obtained by Israel showed Iran had deceived the world by denying it had ever sought nuclear weapons. Iran agreed in 2015 to curb its nuclear energy programme in return for the lifting of sanctions. It maintained that it had only been pursuing nuclear energy. But Mr Netanyahu accused Iran of conducting a secret weapons programme until 2003 codenamed "Project Amad". He claimed Iran continued to pursue nuclear weapons knowledge after Project Amad was shuttered. Iran pushed back against the claims. Foreign Minister Javad Zarif tweeted to say the evidence was a "rehash of old allegations" which had already been dealt with by the United Nations nuclear watchdog. Iran's foreign minister accused Mr Netanyahu of a "childish" stunt to influence President Donald Trump's decision on whether to remain in a nuclear deal with Iran. The US along with five other international powers struck a deal with Iran in 2015 to curb the country's nuclear programme. Mr Trump, who has long threatened to scrap the Obama-era deal, said he had viewed part of Mr Netanyahu's presentation and said the situation was "not acceptable". A White House statement said there were "new and compelling details" in Mr Netanyahu's material. "These facts are consistent with what the United States has long known: Iran has a robust, clandestine nuclear weapons programme that it has tried and failed to hide from the world and from its own people," the statement went on. However, European powers have said they are committed to upholding the accord. "We have never been naive about Iran and its nuclear intentions," said a UK government spokesperson late on Monday. "That is why the IAEA inspection regime agreed as part of the Iran nuclear deal is one of the most extensive and robust in the history of international nuclear accords." Mr Netanyahu said he had spoken to the leaders of France and Germany about Israel's intelligence and planned to send representatives to the two countries to discuss it. A German government spokesman said the country would carry out a detailed analysis of Israel's intelligence, Reuters reported. John Hughes, a former deputy director for sanctions at the US State Department who worked on the Iran deal, said he had not seen anything in the Israeli presentation that would change the deal. "I think, frankly, this was a political statement meant to try to influence President Trump's decision on whether to pull out of the deal," Mr Hughes said. "I think it's mostly recycled material." Could the nuclear deal collapse? This was political theatre from the Israeli prime minister, but to what extent was it revelation? 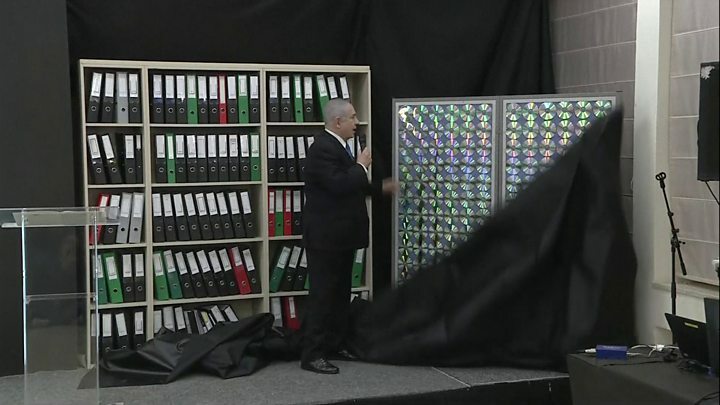 Israel's claim to have been able to steal or access files and documents from what it says was the secret Iranian nuclear archive located in a warehouse in south Tehran may be a tale of daring espionage in itself but, beyond that, what is really new? Iran of course has insisted consistently that it never had a nuclear weapons programme but there were growing international concerns about its nuclear activities. That is precisely why the major powers entered into the 2015 agreement with Tehran in the first place, both to contain its nuclear programme and to introduce a greater level of outside scrutiny. France, Germany and Britain who all back the maintenance of the agreement have had their say with Mr Trump - the US president must decide upon its fate in mid-May. Now Mr Netanyahu has had his turn to put the contrary view. What 'proof' did Netanyahu produce? The files had been shared with the US, Mr Netanyahu said, and would be submitted to the International Atomic Energy Agency (IAEA). How is the 2015 deal meant to work? The agreement signed between Iran and six world powers lifted crippling economic sanctions in return for curbs on Tehran's nuclear programme. How dangerous is the enmity between Israel and Iran?